At a time when many colleges are only now considering tuition resets, the Wilson College Board of Trustees voted this past weekend to hold the line on tuition for an eighth consecutive year. Orchesis, Wilson College’s undergraduate dance ensemble, will present its fall performance—Glimpse—at 7 p.m. Friday, Nov. 10, and 2 p.m. and 7 p.m. Saturday, Nov. 11, in the Appenzellar Buchanan Dance Studio in Davison Hall on campus. The Wilson College Veterinary Medical Technology Club that had been set for Oct. 14 and 15 has been canceled due to unforeseen circumstances. Wilson College is seeking artwork made by area high school students for an upcoming juried art show to be held at Wilson’s Bogigian Gallery in Lortz Hall. 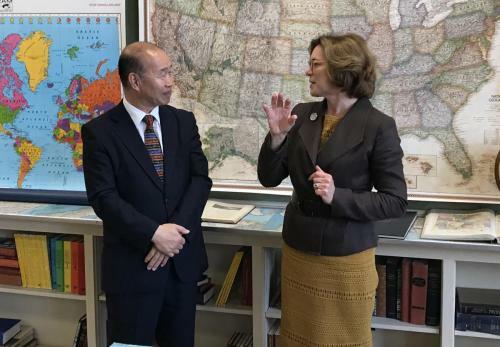 High school students attending the Global Vision Christian School in Scotland, Pa., as well as the school faculty and staff, will be able to earn college credits by tak ing courses at Wilson College, under a dual enrollment agreement signed today. Recent Wilson College graduate Brant Swartz estimates that his entire student debt will be about $20,000 but he can deduct $5,000 right off the bat, thanks to Wilson’s unique student loan buyback plan—a program that rewards students who excel academically, complete their bachelor’s degree in four years or less, attend financial literacy sessions and are involved in college life. An educational, fun-filled day of free events that encourage the appreciation and celebration of interdisciplinary arts will be held Wednesday, Oct. 11, on the Wilson College campus. Wilson College will join the Colonial States Athletic Conference in 2018-19, a move that is expected to enhance the overall student-athlete experience by aligning Wilson with other small, private colleges and providing more balanced conference competition. Wilson College will host simultaneous receptions marking the opening of two free art exhibitions on Wednesday, Sept. 13—one featuring the work of members of The Foundry and one featuring the work of Hagerstown, Md., artist Kate Miller.